In recent weeks, we have seen more evidence of large management consultancies building capabilities in marketing services with the announcement that Deloitte Digital has poached DigitasLBI’s figurehead mobile advertising leader Illico Elia. This follows Accenture’s hiring of Amir Malik, Programmatic Director of Trinity Mirror Group. This talent acquisition drive appears to be the next phase of development following a small but significant number of strategic business acquisitions by large consultancy firms. One of the higher profile acquisitions was Accenture Interactive’s purchase of Karmarama in Autumn 2016, which was seen as something of a game-changer, followed by the purchase of a majority stake in German digital agency SinnerSchrader. These developments go beyond signalling strategic intent and move Accenture a step closer towards their stated mission of becoming a ‘key strategic marketing services provider’. Their aim is to disrupt the marketplace by bringing together the best business brains, IT systems and processes along with ‘creativity’ (cue evil laugh and cat-stroking). So the question remains; “is the threat that management consultants pose to agencies and holding companies really rising?” Time will tell, but the holding companies and the media agencies in particular should be alert, but not alarmed. Some are already raising their game and preparing to counter the looming threat. IPG and Publicis CEOs have made no secret of their vision to move towards a consulting or “platform” model. Publicis Group’s purchase of Sapient and Dentsu Aegis’ purchase of Merkle are intended to strengthen each network’s offering in ‘business transformation’ – language deliberately designed to catch the ear of CEOs and CFOs, not just CMOs. The overall consensus appears to be an inevitable overlap in the provision of marketing technology and performance marketing services, but agencies still hold most of the cards here. Organisations which are data-driven, customer-centric and aiming to be more self-sufficient are likely to be number one prospects for the management consultants. There are two barriers which might impact on the success rate of the management consultancies: breadth of resource, and depth of capabilities. Marketing professionals typically buy into an agency for its culture of innovation, creativity, service and access to the smartest people to solve big marketing and communications challenges. Having Deloitte or KPMG around that table with agency account teams and planners would change the dynamic. Having Deloitte or KPMG around that table with agency account teams and planners would change the dynamic. Consultancies are hired to transform business models and ask the difficult questions. Their focus is reorganisation and reprocessing; taking out risk and replacing uncertainty with more measurable outcomes. Whilst the digital arms of Consultancies will claim cultural clear water from their respective parent companies, this way of working is in their DNA. This development (transformative vs collaborative) has big implications for marketers, particularly those which have nurtured strong relationships with their agency partners. Technological developments and the proliferation of marketing digitisation presents an opportunity and a challenge to agencies. There is little to stop an organisation setting up the technical infrastructure to effectively compete in a biddable world. However, the core purpose of an agency partner has always been to help clients meet business goals through smart communications strategies, executed to provide a competitive advantage. Agency networks’ expertise falls into four key areas: audience insight, communications strategy, media execution, measurement and evaluation. This full-service offering is currently unchallenged by Management Consultancies as they lack the executional capability of media buying or content production, or their own trading desks. The proposition from management consultancies is ensuring advertisers have the right infrastructure, platforms and management processes in place. Clearly, they have recognised that the lack of creative capability could be considered a barrier to extending their offering into advertising services. 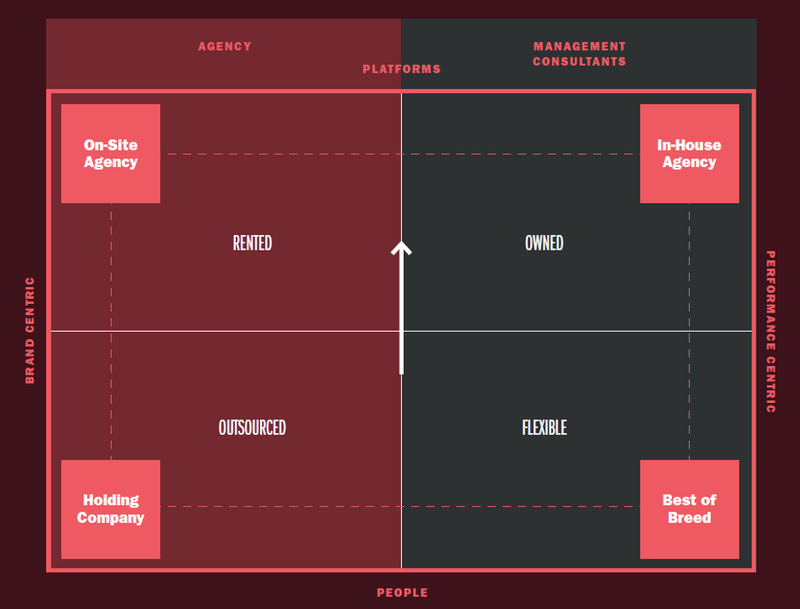 Agencies already have the full suite of services, and the people to deliver them. Advertisers wanting the creativity, expertise and service ethos of an agency but the control and integration of in-house specialist teams are increasingly in-sourcing agency talent and turning to flexible on-site agency models. As consulting giants and agency networks alike seek to broaden their respective service offering and product portfolio, they share a common challenge integrating into existing brand marketing cultures and processes. This is a task that should not be under-estimated and the more diverse a client’s businesses, the harder it will be for management consultants to gain a foothold. We have yet to see strong evidence that consultancies can provide a fully connected offering to advertisers that would truly replace what agency networks offer, however, the threat is very real. Four consultancies sit in the 10 largest agency companies in the world (Accenture, PwC, IBM and Deloitte), and they continue to appear on a growing number of pitch lists. We can expect further acquisitions and senior level appointments from both parties, but the vast majority of large advertisers ultimately want partners who place consumer insight, strategy and execution core to their purpose.